When Grandpoint shifted its focus and aimed to be a community-focused, commercial business bank, the company needed help reframing its story. Grandpoint had acquired nine banks and doubled in value twice. As the company stepped onto the regional stage, it needed to communicate its collective value without disrupting the existing relationships at the core of each acquired bank’s success. Grandpoint Bank sought our ongoing strategic insight to help them pivot and communicate their new vision effectively. 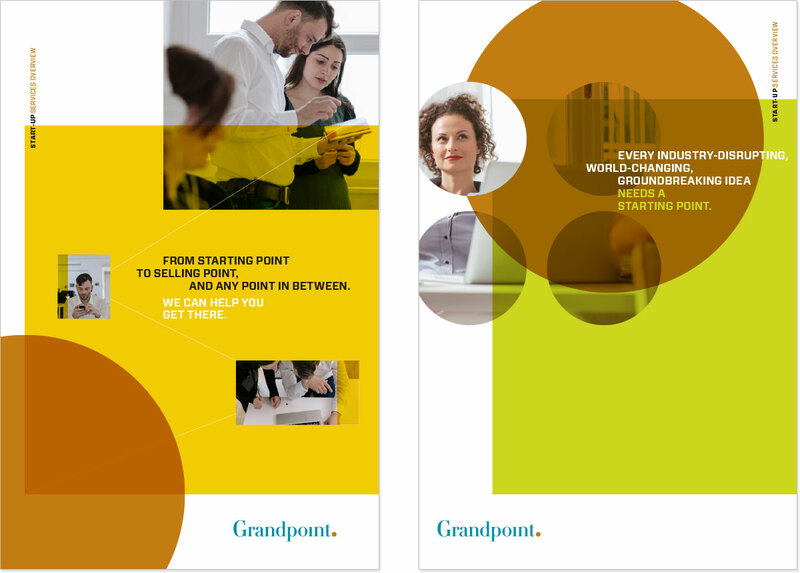 Grandpoint needed to create a memorable brand story and identity that would express its unique service philosophy and aspiration to be a top-tier banking services provider. We worked with Grandpoint to uncover the shared threads behind the company’s acquisitions and identify the common ground comprising the Grandpoint experience. The bank offered a focus on relationships, a problem-solving perspective and deep banking knowledge. We positioned Grandpoint as a consultative resource with out-of-the-box, entrepreneurial thinking and an aim to “help people grow and build things” — a purpose derived straight from the leadership’s thinking. At the center of the bank’s messaging, we married Grandpoint’s broad platform of resources at the regional level with its personalized relationship focus at the local level. To support this defined positioning, we designed program components including a logo, tagline, proprietary brand imagery, stationery, signage, collateral and a website — all featuring a distinct look-and-feel and conversational tone suitable for Grandpoint. The resulting creative content gave a human face to the bank. It captured the spirit, vitality and character of Grandpoint: smart, reputable, collaborative, confident and classy. The new identity provided a flexible and scalable platform for growth, as Grandpoint integrated two acquisitions made within the first few weeks of the launch under the Grandpoint Bank brand.